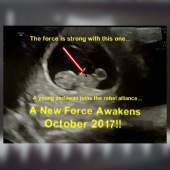 Our little padawan is on their way!! 1st babies are strong with the force, so they need lots of tools to funnel and train their powers!! Help us give her all the tools, toys and must-haves that every baby jedi needs!